world's largest volcanic eruption ever. the world's most spectacular geographic phenomena. was the island of Santorini really the lost Atlantis ? Akrotiri, the Southern tip we can still see the outline of the once circular island. 72sq. kilometers. This is the size of our caldera 83sq. kilometers. Santorini's caldera is one of the largest of the world. original name was "Strongili" which comes from the Greek word "strogilo" meaning round. the view is quite peaceful. inhabitants. It is a saying that Pyrgos has more churches than houses, more donkeys than people and more wine than water. flights per week. 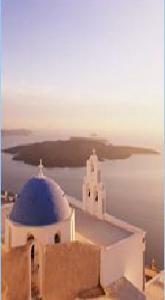 Santorini belongs to a group of islands called "Cycladic". "Cyclades" comes from the Greek word "cyclos"
which means "circle". If you look at a map of Greece you will be able to see that the Cycladic islands form a circle on the map. Santorini is the Southern most island of the Cyclades. Greek word "mesi" which means "middle" "Messaria" means "in the middle"-in the middle of the island. banned, a big damage would have been made to the island. The whole island would have been destroyed. contain jewelries brought from all over the world and of course the Greek hand made pieces. the Caldera. there is a strange rock formation that protrudes from the front of the village. This rock formation is called "Skaros"
destroyed in 1956 during the terrible earthquake that registered 7.8 on the Richter scale. Santorini is a very seismic island. 72sq. kilometers and has a permanent population of 10.000 inhabitants. There are 13 villages on the island. there are vines that are 65 years old. In the winter, when all the leaves fall off, the island looks like it is covered in baskets. by donkeys to their wineries. White, red, semi-sweet and very sweet are some of the wines Santorini produces.